↑ Black, Jeremy A.; George, Andrew; Postgate, J. N. (2000-01-01). 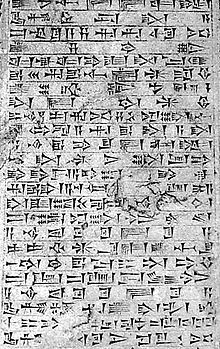 A Concise Dictionary of Akkadian. Otto Harrassowitz Verlag. p. 10. ISBN 9783447042642. ↑ John Huehnergard & Christopher Woods, "Akkadian and Eblaite", The Cambridge Encyclopedia of the World's Ancient Languages.